A simple and inexpensive, but also well designed and well placed external antenna will massively enhance the range you can send and receive radio signals. Several readers have asked us how best to communicate with other nearby friends and family in an emergency when landlines and cell phone service is all unavailable. Maybe you too want to be sure to be able to reach your children in their schools, your spouse at their work, or your parents in their retirement village. If they are relatively nearby, this might be relatively easy – but it also may not be so easy. Hopefully this article will help. The short answer is of course to use two-way radios, but there’s a lot more to how to do this effectively. We’ve written many articles on the subject in general before (see our complete listing of articles on wireless and other communications here), and in this article we want to focus primarily on communicating between two houses or apartments that are perhaps a mile or two or three apart. If you’re wanting to communicate with someone more than a few miles away, it may still be possible using the techniques in this article, but if it proves impossible, don’t be alarmed. We will shortly be publishing a second article, explaining techniques enabling you to communicate up to about 200 miles. So, concentrating initially on short-range communications, please have a look at our article about how to choose the best portable radio for FRS/GMRS use, and then after revealing our current favorite (the Baofeng UV-5R and/or F8HP series), we talk about how to best accessorize the Baofeng radios with better antennas and other useful add-ons. We also have articles on how to maximize the range of your walkie-talkie, and a two-part series on how to choose and use the best antenna for your radio. Now, let’s answer the question how to communicate with someone else a mile or two (or maybe three or four) away? First, why do we choose a this as a distance to consider? Because this may possibly be the maximum distance, in a city environment, that you can realistically expect to be able to experience convenient easy simple and affordable communications using regular VHF or UHF type portable ‘walkie talkie’ radios and with small convenient antennas. Sure, out in the countryside, or on the water, you might get ten times this range, but in a city/suburban environment, your range will probably be more like a mile or two, maybe three or four if you are lucky and have great antennas. Depending totally on the terrain and obstructions between you and the place you wish to communicate, you might get more than a mile or two, or you might get less, even with powerful radios and great antennas. We know, based on experience and guesswork, what sort of works and what sort of doesn’t, but you’ll probably have to do so on a trial and error basis. Fortunately, the costs of doing so are not huge. The first thing to consider is how blocked your radio signal might be between your location and the location you want to communicate with. Can you physically see, with a telescope or pair of binoculars, the other radio’s antenna from where your antenna is located? If the answer to that is yes, then you’ve a very high probability of being able to communicate. If the direct ‘line of sight’ between you and the other radio is blocked by trees, you might still be okay, depending on the density of the trees, and if they are wet or dry (dry is better than wet). You will probably find better results with VHF rather than UHF communications in such a situation. If the direct ‘line of sight’ between you and the other radio is blocked by buildings and other man-made structures, you still might be okay, but in such a case, you are more likely to get better results with UHF rather than VHF communications. If you’ve got a hill between you and the other radio, then you’re probably out of luck. You need two key things. Both are simple, and neither needs to be unduly expensive. A good radio, and a good antenna. For the radio, if you use one at a fixed location, it doesn’t need to be a handheld transceiver (HT) – it can be a ‘base station’ type radio. If you get an HT, it probably is limited to a maximum power of 5W or thereabouts. This may be all you need, but if you’re struggling with very marginal reception, then you might get some benefit by increasing the power, either by adding a linear amplifier to the output from your HT, or buying a more powerful radio to start with (which is probably the better choice). Mobile radios typically transmit up to 50W of power, and base station radios might be even more powerful again, all the way up to 1.5kW. The key consideration is that whatever type of radio you select, you of course then need to be able to provide it with the electricity it needs, and the more transmitting power it radiates, the more electrical power it needs to drive that. As a rule of thumb, you should assume that you’ll need 1.5 times as much power into the radio as you are transmitting out. This is not a problem normally, but if you lose your mains power, you then need a reliable power source capable of providing almost as much as 100W of power while you are transmitting on your 50W transmitter, or more than 2kW if you’re going wild and crazy with a maximum 1.5kW transmitter. Unless there are real reasons for needing to go over 50W, we suggest you stick to that as a maximum power level, because in truth, there are very few situations where you’ll get more range with 500W than you would with 50W, and anything over about 100W requires special (ie more expensive) antennas to handle the extra power. We like mobile radios because they are designed to operate in a vehicle and from a 12V DC power supply. It is easy and affordable to buy a single ‘golf cart’ type 12V lead acid battery and a trickle charger for it, so that you can always have many hours of emergency power for your radio (and other things too) if the power fails. See our article on emergency low capacity power supplies for more information on how to power devices such as radios in an emergency without mains power. You can choose either a mobile radio that only operates on VHF frequencies (ie 138 – 174 MHz – approximately the 2M ham band or thereabouts), one that only operates on UHF frequencies (ie 400 – 480 MHz – approximately the 70cm ham band or thereabouts), or a dual band VHF/UHF radio, or a multi-band radio that operates on more than two bands (perhaps adding the 1.25M band, maybe adding other HF frequencies too). A single band radio is of course less expensive than a dual or multi band radio, but is also, of course, less versatile, too. Some mobile radios are slightly more powerful than others (some go up to 75W, others are no more than 40W) but you’ll not really notice much difference in range between these two extremes, while you’ll definitely notice a difference in battery life, so we’re not too fixated on transmitting power. Currently our preferred mobile radio for people on a budget is a dual band AnyTone AT-5888. Amazon sells it for about $300. This radio is distinctive because in addition to the narrow ham frequency bands which most radios are restricted to, it will also transmit on other nearby frequencies such as GMRS and FRS and MURS. This is of course illegal, but in a true emergency, you would be allowed to make use of that extra feature (click link for our discussion on that special dispensation). You’ll see plenty of ham radios that seem to offer broad frequency band support, but if you carefully read the fine print, you’ll see that while they receive signals over a wide range of frequencies, their transmit abilities are restricted to only the ham frequencies. If all you need – or all you can consider (eg for taking to school or carrying in a handbag) is a handheld walkie-talkie, then probably the Baofeng UV-5R series is your best choice. Choose the cheapest UV-5R from this page on Amazon – ignore the claims about ‘newer model’ or ‘improved’ etc. They all have identical electronics in them, no matter what their exact model designation or outside case appearance or marketing claims may be. This is the most important part of your setup. You’ll have more influence over the effective range that you can both send and receive communications by choosing the best antenna than you will by choosing a more powerful radio. If you are using any type of HT radio, you should immediately replace the provided ‘rubber ducky’ type short stub antenna with a better after-market antenna. Even high-end radio manufacturers seem to perversely delight in providing a low quality antenna as standard, and you’ll get markedly better reception and transmission with an after-market antenna. In the specific case of the Baofeng UV-5R, you should replace the provided antenna with either a Nagoya 701 or a Nagoya 771 . The 701 is more portable, the 771 is longer but more fragile, so generally the 701 is perhaps the better choice. However, they are both very inexpensive (about $12 each) you may as well get one (or more!) of each. When I am arranging for a child to carry a portable radio with them, I unscrew the antenna so that it is easier and less bulky to carry (and also less fragile). It is very easy for them to screw in the antenna before using it. The same is true of, eg, a woman wishing to carry one in her handbag. If you are considering a radio for use in a vehicle, then you absolutely must add a roof mounted external antenna to the radio. This will give you a further significant improvement, even over using an improved type of antenna directly on a portable radio inside the car. The Tram 1185 is a fairly priced dual band antenna (under $30), but if you are only going to be using a single band, then it is much better you get an antenna designed specifically for the one band you’ll be using. The first is to get your antenna as high up as possible. The higher up the antenna, the much better the range it will have, and the less impact obstructions will have – the radio signals will literally go over the top of the trees and buildings (if you get the antenna up high enough, of course!). The second is to get your antenna out of the house rather than keeping it inside. Why force your signals to go through the side of your house, and have them lose strength and range because of it? It is of course much better to have the antenna outside, with one less obstruction between it and the other antenna it is trying to send to/receive from. A related concept is that if you can’t position your antenna somewhere with an unobscured 360° view of the surroundings, at least try to position it on the ‘best’ side of your dwelling, so that the directions you are most likely going to be communicating in are least obstructed. The good news with both VHF and UHF antennas is they don’t need to be very big in order to be very effective. Because they are small in size, they are also light and sturdy and less likely to be damaged by wind and other adverse weather. If you are in a situation where it would be difficult or not allowed to have an external antenna, don’t despair. You could either wait until an emergency and then mount an antenna outside – perhaps you already have prepared mounts that are inconspicuously present, so all you need to do is drop the antenna in. 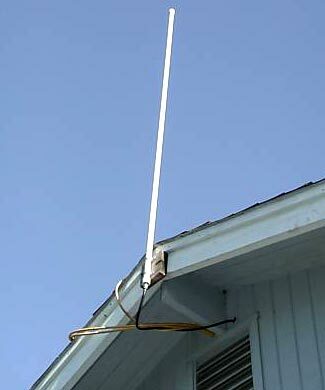 Or perhaps you have a temporary/emergency antenna that you just hang off the side of your house/condo/apartment when you need to use it. Indeed, we’d go as far as to recommend not having a permanent external antenna (unless you’re an enthusiastic ham and use your radio for other purposes on an ongoing basis). If you keep your antenna inside and only mount it outside when it is needed, then you are more assured that it won’t be damaged. Wind, debris, and UV radiation from the sun all take their toll on antennas, and the last thing you need is your antenna to fail right when you need it most, and/or for the weather emergency that is causing you to need to communicate with others to have also destroyed your antenna. Antennas are both cheap and essential, and so we’d recommend having several of them as ‘just in case’ backups. There are a number of good antenna designs and suppliers out there, and each have their fans. But when you hear a person speaking very highly of an antenna, you need to understand what other antennas the person has also tried and scientifically compared alongside their favorite antenna. It is our impression that most people who rate antennas have not actually comprehensively compared their favorite antenna with other possibly similar or superior antennas. We too have our favorite design of external antenna, indeed, we have two favorites – one intended as a semi-permanent type external antenna and the other as an emergency ‘mount anywhere’ type antenna. Both are designed by a professor in California, Ed Fong (he teaches antenna and radio theory so he knows what he is doing), and before you think our own recommendations are also made without having carefully analyzed and compared different types of antennas, let us point you to some articles Ed has written, explaining how his antennas work, testing them, and setting forth the specific ways in which his antennas are better than others out there. Ed does not make these antennas as a business – he and his graduate students make them as a way to earn funds that go to tuition scholarships, and because of that, he doesn’t even have a website. He sells his antennas either directly or through eBay, and last I checked, they are about $26 each. If you’d like to buy one (or both) of his antennas, you can email to Ed edsantennas@gmail.com, or you can search for his antennas on eBay and buy them from there : http://myworld.ebay.com/antennas_iqn/ . You can tell him the frequency bands you want the antennas made for and he’ll cut them to exactly the lengths you need. Alternatively, if you do the sums yourself, you can of course use the information in his articles and make the antennas yourself. Oh – it seems we’re pushing you to buy his antennas. Maybe that’s true, but in case you think we’re doing so for nefarious and selfish reasons, we hasten to add we don’t get anything at all from Ed in return. Although we’ve bought antennas from him, he doesn’t even know who we are or about this website. We simply consider them to be the best, and the best value, antennas out there. Now for an additional consideration. We have been talking exclusively about omni-directional antennas so far – ones which radiate their signal, and receive incoming signals, equally in all directions. Sometimes you might get a better result from a directional antenna – please see our new article all about directional antennas for more information on this point. With the best antenna, located as optimally as possible, and connected to a good quality receiver with a reasonably high power transmitter (ie probably about 50W), you’ve done about all you can do to maximize your range within the VHF and/or UHF frequency bands. More power – an obvious seeming possible approach to get more range – will not really make much difference at all. If you can’t get connected with the people you need to connect with after optimizing these things at both their end and yours, you need to consider other strategies. There are two more reasonably practical radio/wireless solutions to consider, and we will shortly be publishing an article explaining those as well. Thanks for posting this! I’m really Looking forward to the follow up to this article on communication over longer distances on VHF/UHF. I’ve been following preparedness sites since 2008 and I think yours is by far one of the best. In my opinion it is better than the vaunted survival blog due to the structure, presentation, ease of navigation and subject tags, use of graphics and hyperlinks, as well as the great job you do of condensing a lot of valuable information and content into concise and highly readable posts that are just the right size for assimilation. Additionally, I like the fact that many of them stack one upon the other like building blocks to give further and deeper understanding of the knowledge being imparted. They remind me a lot of the field and technical manuals back when I was on a howitzer and later in a target acquisition section in the Army. It’s much appreciated, keep up the GREAT work! Not to knock Dr. Fong’s antennas, but also take a look at N9TAX’s dual band antennas at http://www.2wayelectronix.com/ . He also makes antennas to meet your spec’s, with coax length and connectors of your choice. These fall into the “roll-up” catagory, handy for bug out situations; Just hang it from a tree. I have mounted mine permanently on my roof using a bow mount described at n9tax.com. The N9TAX roll up is similar to Ed Fong’s DBJ-2. Indeed, it would be very interesting to know what the differences are between the two. As for the UV-5R radios, you’re absolutely right on both points. They are dropping in price, and you can never have too many of them. Now if only mobile stations would go down in price too – at almost $300 each, that’s a tangible pain to one’s wallet each time! Just spoke with Ed, great guy, very helpful. I ordered a base antenna for my HT and a roll up for my ARES go back. Your Article is great. I have 2 Baofeng radios and they are great. Plus I have a Puxxing small UHF, and now I’m going to buy a TYT radio that has 220 mhz in it. All cheapo’s and easy to REPLACE if need be. Also the Nagoya antennas have proven to be fantastic with these little radios. One of the guys is getting fantastic results with his. I have a GMRS license and a ham license. The old UHF repeaters are getting cheaper to buy now. Mine were $1200 and 800, now are 500 or less!!! And in emergencies a magnet mount on a 12×12 piece of sheet metal works fine, try it out. It’s remarkable for emergencies. Last for all to consider, now is the time to get your Ham license. Answer 35 questions and all this are legal. I did and it’s a lot of fun. If you have a scanner in your vehicle like I do, in most states that will help keep you legal for the scanner also. That is serious business in some states; you pay more fines and or jail time for having a scanner. So think about the ham license, now before it changes.